Many polymer artists, especially those who are making series or duplicates of items, rely on color recipes to make uniform pieces. For those of you who have been with me for awhile now, you know that I rarely use recipes. Why? Because I like that all my pieces are different in color, that I don’t repeat colors, and that nothing I make is ever identical. To me it adds to the special nature of my sculptures. 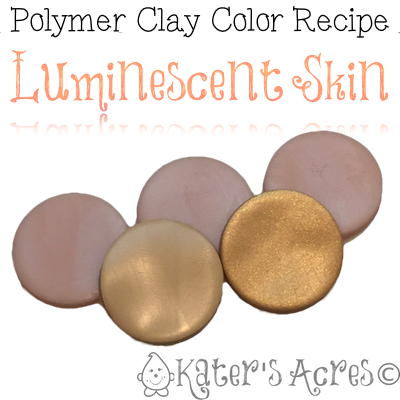 But I’m not the norm when it comes to polymer artists… However, this is my favorite recipe and I rely on it often, it’s how I like to make my skin for my figurines. I like my skin color to have a bit of metallic luminescence and over the years I have relied on this recipe to achieve this slightly glowing look to the skin. This super easy recipe is easy to duplicate over & over again. And as an added bonus it helps to hide moonies/plaquing in the clay. Adding pinches of other colors to the main recipe (get the recipe here) will alter the way it looks.